I have been wanted to go to a traditional floating market since I have been in Thailand. I decided to take a day trip the other weekend to Amphawa, which is just south of Bangkok. 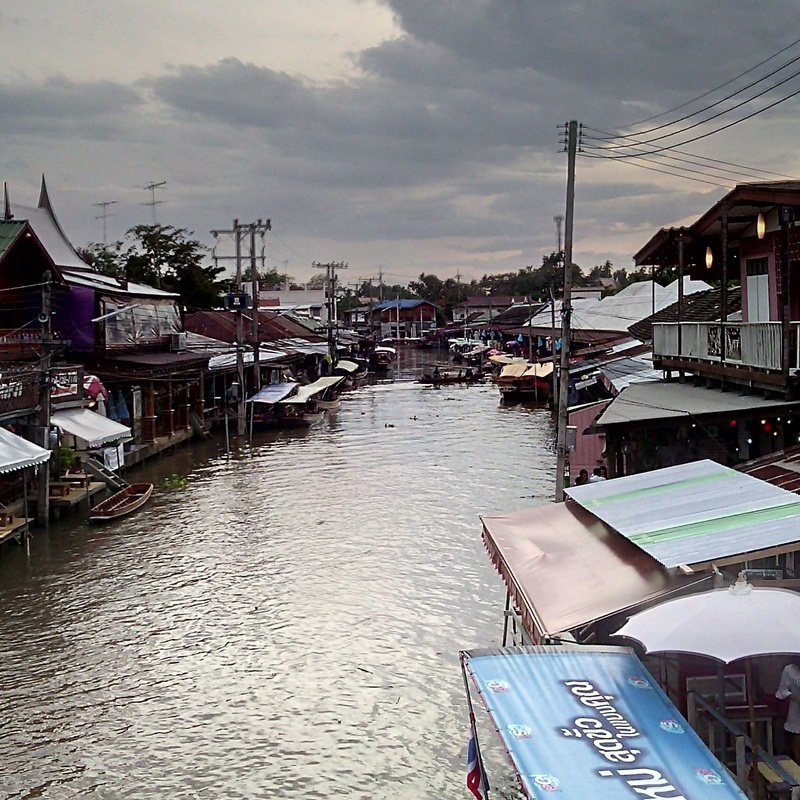 Amphawa is not the popular tourist floating market that most people go to from Bangkok. It is not a typical floating market as it gets busy in the afternoon rather than early morning. It was easy to get to Amphawa from Bangkok. To get here, take a van from Victory Monument. The easiest place to find a van is leave the Victory Monument BTS at exit 4, walk about a 100m then turn left to the van station. It cost 80 baht each way. After a peaceful 2-hour journey, I arrived in Amphawa, where I brought a return ticket to make sure I could get back to Bangkok. 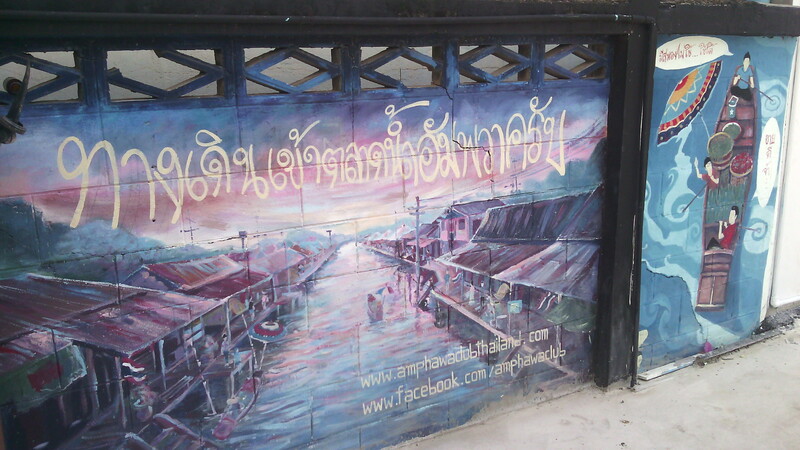 When I got off the van, I saw a sign to the floating market, which was a short walk away. The canal was surrounded with rows of shops selling food, souvenirs, and clothes. There were a few boats on the canal selling food mostly. When I researched Amphawa, there were a few places I wanted to see so I found a long boat tour that took me to 5 different temples, which cost 50 baht. The only catch is that I had to wait on the boat until it was full, which I didn’t mind as I wanted a relaxed day. Soon, the boat was packed, all with Thais. It was lovely trip seeing different scenery and temple. The first 4 temples, weren’t anything special but I got blessed by a monk at one of then, who gave me a bracelet. It was interesting to observe the local buying flowers, incense as an offering to Buddha. At each and every temple, they did this. The final was the temple I wanted to see: Wat Bang Kung. As I departed the boat, I was faced with a animal petting area with camels, goats,deer and some other animals. They were so cute. 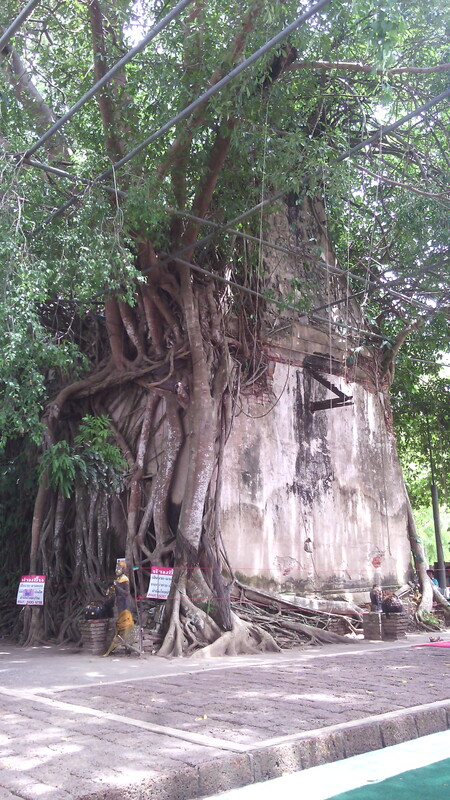 I walked up the road to find the temple in a Banyan Tree, which was crowded with people but looked really cool. There are many statues of fighting men and an aeroplane. Once, we the long tail boat speed back to the market, I had a pad thai made by a woman on one of the floating boats and I sat facing the canal and enjoying my food. 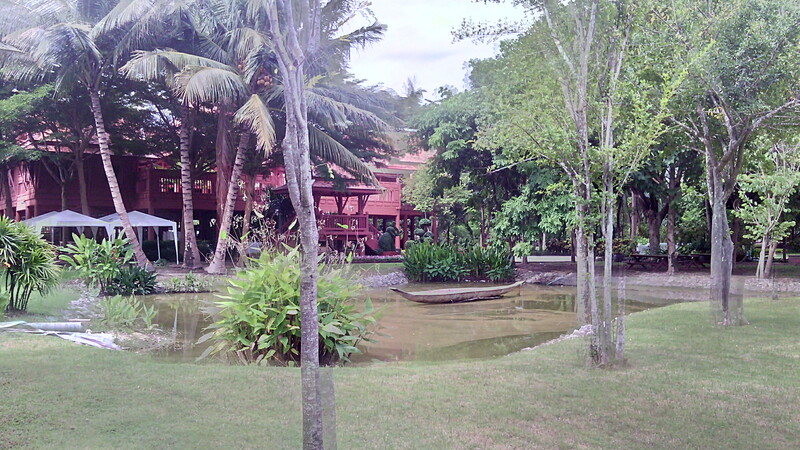 I wandered through narrow markets, full of sample and different food to find the Thai dessert museum, which wasn’t really worth going to but the surround garden was beautiful. After, I went back to the canal area to get a foot massage, which is just what i needed. There is only one massage place along the whole of the canal and they also give massages on empty boat. Late afternoon, I tried different Thai desserts and food before hopping on the firefly long tail boat tour, which was incredible. I don’t think I’ve ever seen fireflies and they covered trees in the dark. The driver caught a firefly and showed me as I was sitting at the rear of the boat. It was just amazing. 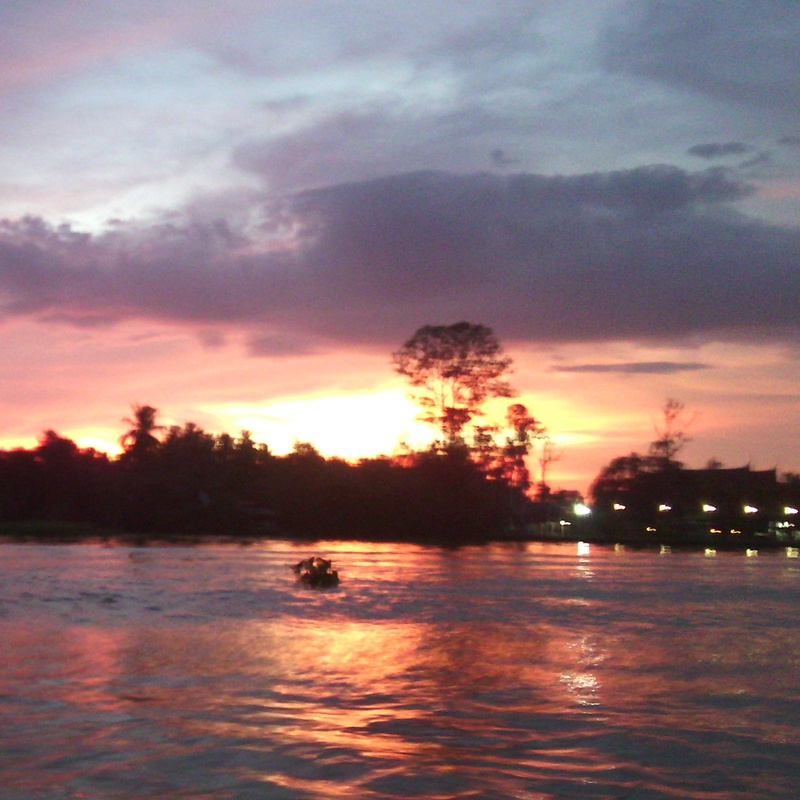 I went on the tour at the perfect time, where I saw the sunset on the river before seeing the fireflies. After the tour, I got a van back to Bangkok. I had an amazing day and would totally recommending going to Amphawa.